2 Timothy 2:2: Welcome Back! Saralynn and I are back from our anniversary vacation. OK, we've been back for a week, but it was a busy week - getting back to work, playing with the kids, etc. Oh, and celebrating our 10th anniversary, which was actually this last Thursday (2/22). Here was the prediction I made this past Sunday: "The year 2007 is the make-it or break-it year for Oak Tree Community Church. I believe this." Neither Saralynn nor I had been on a cruise before, but we have decided that in order to determine whether we really like it or not, we should do it a second time (or maybe third, fourth). Really - we thoroughly enjoyed it. It not only allowed, but forced us, to leave a lot of "stuff" behind and focus on just us - especially since phone calls could cost up to $10 per minute to talk to people at home! Here are a few pics of things that I found to be important enough to capture digitally. 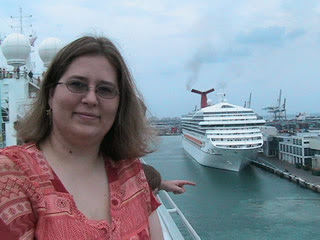 My awesome wife of 10 years - first day on the ship, leaving from Miami, FL. Love you, babe! Also, in St. Thomas lives one of the creators of Yoda. 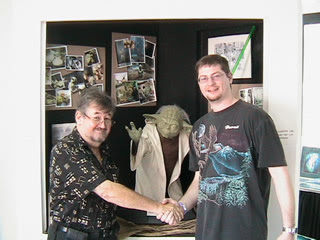 I'm shaking his hand in front of a life-sized Yoda. 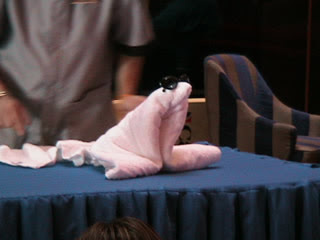 Every evening we had a different "towel animal" on our bed when we returned from supper. Saralynn attended a hands-on demo and learned how to make things like this "cool" seal. 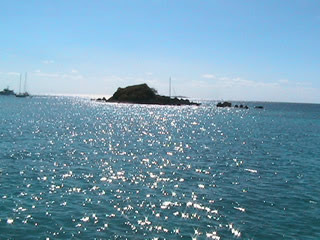 The main object of this blog is reflected in its title. In 2 Timothy 2:2 Paul encourages Timothy to keep passing on the spiritual truths he has learned and to do it in a strategic way so that it never stops. It's not just about teaching people the Bible. It's about teaching specific people specific things that they can intentionally pass along to others. No one can know everything about the Bible, but everyone can know something. While we're not all called to be formal Bible teachers (see James 3:1), we're all called to make disciples (Matthew 28:18-20), and that means passing along what we know for the building up of a fellow believer. I've read so much over the last couple of weeks that picking just one quote is a pretty daunting task. So let's skip it this time and start over with my next post. Hey, found your blog refreshing to read! Thanks, it's nice to read something without having to overt my eyes, lol! Hey, thanks, Shawn! I hope you find it useful in your personal growth. I can't wait for the 11th to hear your ideas!! 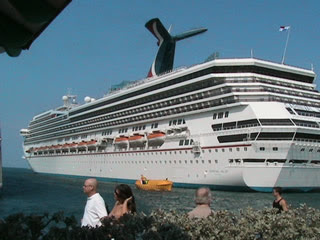 I enjoyed the pictures of your cruise and am happy that you had a wonderful anniversary...many more to come!! I did want to share my verse tonight but I really was blessed to listen to the others. I thought of the time I asked Jesus to be my Savior and it has been almost 50 years! I am in good company with Melba. It has been the last 10 years that I have latched onto Hebrews 12:1&2 and I think it was because it was such a challenge to memorize. So when the world gets me down or I get aggravated with a situation or I start to worry or if I am tempted, I will start "Wherfore seeing we also are compassed about by so great a cloud of witnesses..." and continue thru verse 2. I meditate on "the joy that was set before Him" and wonder at the idea of joy and the cross. I can't help but think that His joy was knowing I and others would believe and have an everlasting relationship with Him. It never fails to make me forget the worries I had before I said these verses. Wow! Thanks for sharing. I hope it wasn't the microphone that changed your mind. I can't wait for next week, too. I have a lot of work this week to get everything into the exact way I want to say it. Lots of prayers are appreciated.